Well today is another food pattern. Ive been on quite a roll with these! Seriously, what is cuter then playfood? I hope you are all enjoying the patterns as much as I am making them. If you have a playfood suggestion, please leave a comment here :) I'll attempt every suggestion made! Pink, white and green yarn, in dk/light worsted/worsted weight (I use DK) and brown if choosing to add seeds. 15: sc around sl st twice and end off. 17: Join green yarn and ch1, sc around, join. (27) End off and weave in ends. 2-3: ch1, turn, sc across, end off leaving a very long tail for sewing. 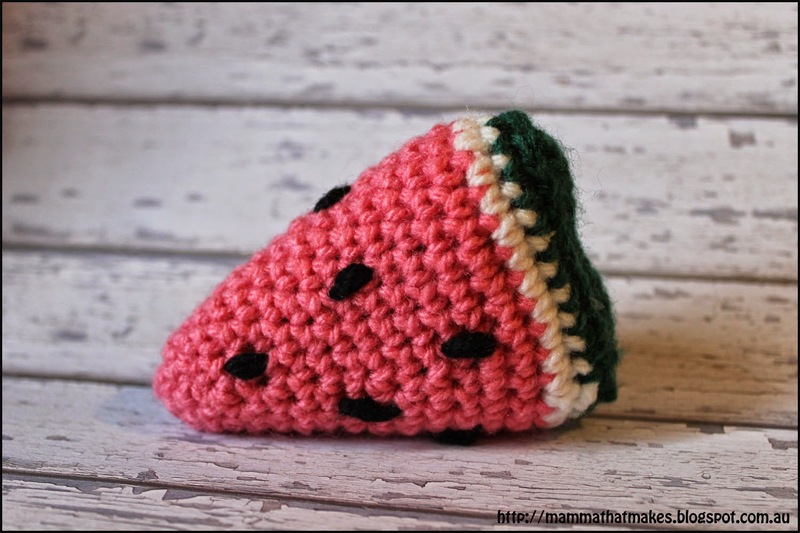 If you want seeds on your watermelon stitch them on now. 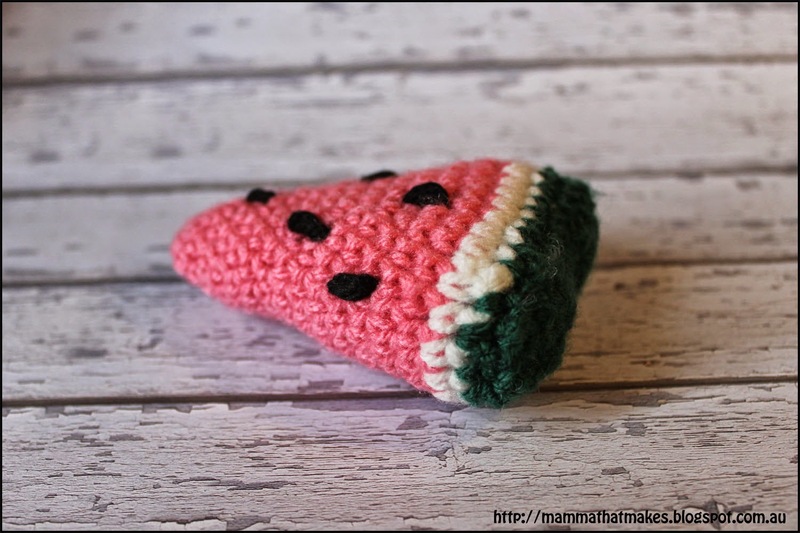 Flatten out the watermelon cone slightly so the shape resembles a slice and lightly stuff it. 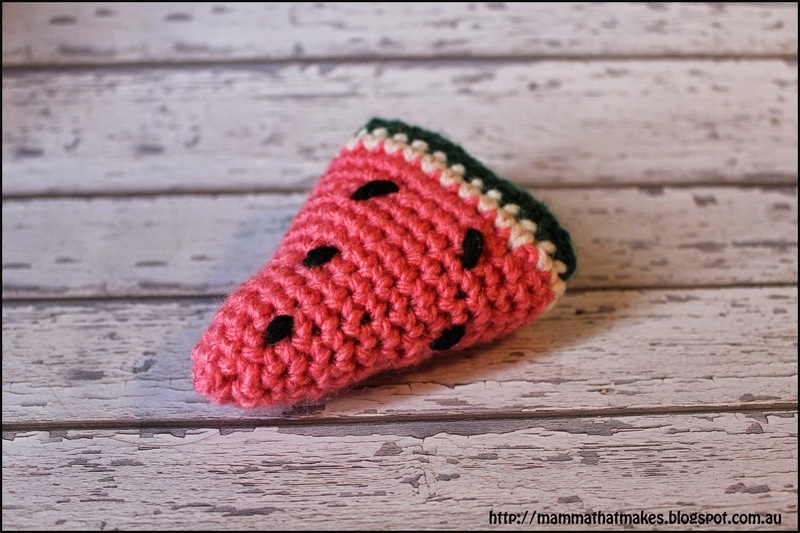 Then sew the base onto the watermelon. That's it, your slide is done! Today's pattern is just so incredibly simple, you will beable to whip up a set in no time! The 7 round booties were designed with charity crafters in mind. We often want to make large quantities of items for donation, and the easier they are to make, well the better! These booties are not only easy to make, but look adorable, and use very little yarn! So they are excellent scrap busters as well. I think that ticks all the boxes! The pattern given is to make a pair to fit an average sized newborn. I'll come back and add notes on various sizes when I've played with them but using a smaller hook and yarn will create preemie sizes very well. Worsted weight yarn may give you booties to fit a 3 month old, but that is just a guesstimate, I have no worsted on hand to check. DK + 4.00mm hook to fit Newborn. dk (8ply) weight yarn in main colour, and a small amount for ties. 2-3: ch2, dc in each stitch around, join. 6-7: ch2, dc in each stitch around, join. End off, weave in tails. chain 80 for a tie (75 for smaller sizes). Weave in and out of stitches on round 6. For a different look, work the last 2 rounds in a contrasting colour. Today's pattern is a simple and quick one indeed! It is for a sweet little chilli pepper. Another addition to my girls playfood barrel. 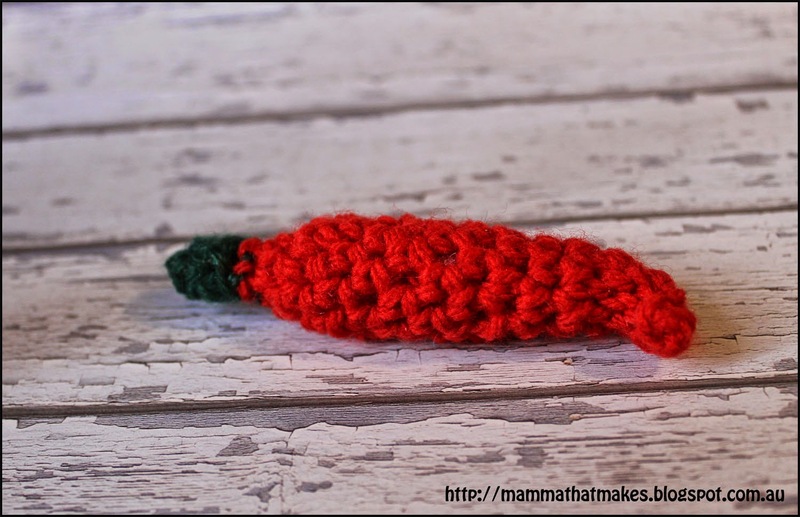 This chilli is about 9cm in length and a fun addition to any playfood set. Try making a bunch and stringing them together for a garland! 1: ch2, sc 5 times in the 1st chain, join. Donations are used to purchase supplies, which in turn are used to design more patterns and tutorials and freebies. I am also happy to accept donations of items, please email me on the myshellecole@gmail.com to get a postal address. Please be aware I live in Australia. I am happy to review your items also. Are you a member of Ravelry? Why not add some pictures of your finished items! All my patterns are written in AMERICAN terms. If you need help translating that to UK terms please leave a comment. All of my patterns are free to use. You can sell what you make. You may NOT redistribute any of my patterns in part or in whole. This means you can not email the patterns, upload them anywhere on the Internet or re-blog them. I take issues of theft seriously and anyone found redistributing my patterns will have legal action taken. You CAN link to the patterns, and if you are linking to them, I am more then happy for you to use one of the photographs that corresponds with the pattern itself. You are also welcome to print the patterns out for personal use. Everything on my blog is offered for use, however I am a firm believer of credit where credit is due. 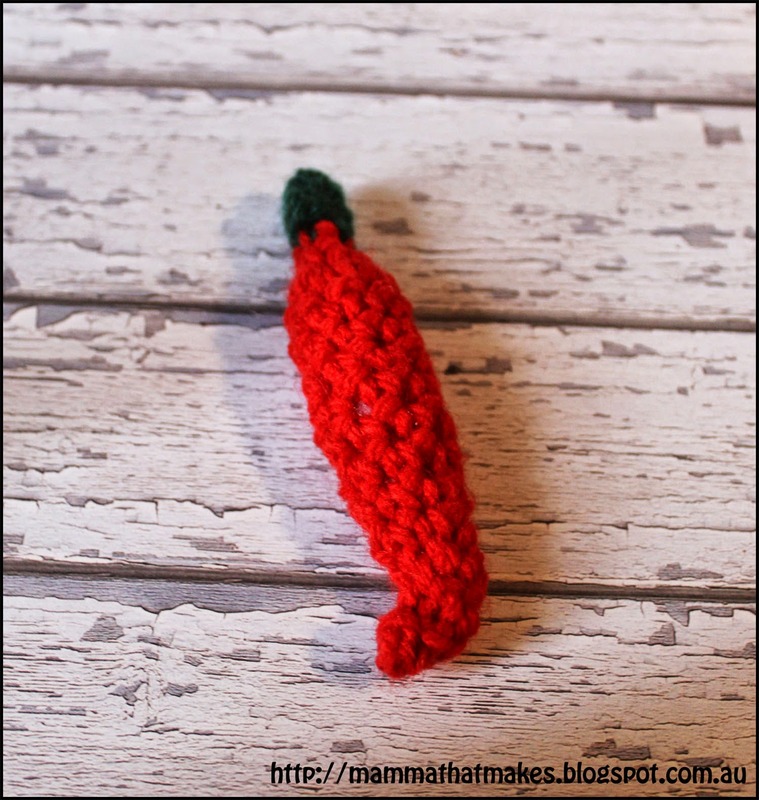 If you use something of mine, be it a pattern, recipe, scrap kit or anything else, and you do upload the finished work to the Internet, it would be much appreciated if you could credit MammaThatMakes for the pattern, kit or inspiration.